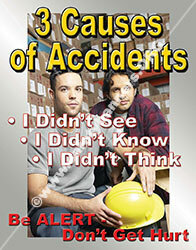 Safety posters for the workplace are a great way to keep safety messages in front of your employees. Here are the best tips to consider for finding the perfect poster designed to capture your audience. Originality - The safety message on your poster has one chance to grab the attention of your audience. Size and location of poster – When you’re searching for a safety poster, consider the placement and color of the wall. You’ll need to make sure the poster will fit in the space and the area is not already too crowded with existing messages. SafetyBanners.Org has posters in horizontal and vertical formats. Message make sense – Make sure the safety poster you select has verbiage that’s organized and the points are easy to read and follow. Demographics - Consider the age, characteristics, etc of the people you want to target. Humorous posters are effective in almost every situation because they're memorable. - Make the intention of your poster known and easy to understand. Posters should reinforce safety topics and motivate positive action. Whether it be for seasonal reminders or for general safety rules. 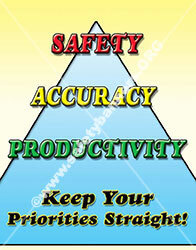 With safety posters for the workplace, you can create visual masterpieces that are one-of-a-kind. 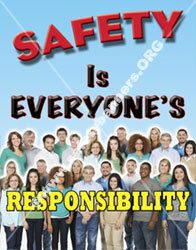 Safety posters are the ideal way to expose your messages to visitors, customers, and employers in every industry.